I am crazy for cobblers all of a sudden. After making them at work last week, I got to thinking about my Flathead Cherries I still have in my freezer from last summer that I pitted and vacuum packed, and thinking about how they need to be used! A cobbler can really be whipped out in no time, and in my opinion it’s just as good as pie, or better. Without as much work! Over the last few years I have grown to love the use of the freezer, and learned how to really take advantage of it. One of my favorite things is reaching in the freezer in the winter or even Spring, when we don’t yet have all the fresh berries and produce, and grabbing a ‘little piece of Summer’ to thaw and use. Around here you really can’t miss out on enjoying Flathead Cherries in the summer time. However, one could easily miss out on enjoying Flathead Cherries any other time of year, if you don’t go to a little extra work when you get them to store some away and take advantage of that freezer! 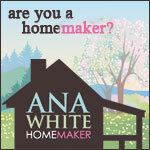 It is so worth it and rewarding. Here’s a little Spring/Summer baking inspiration. 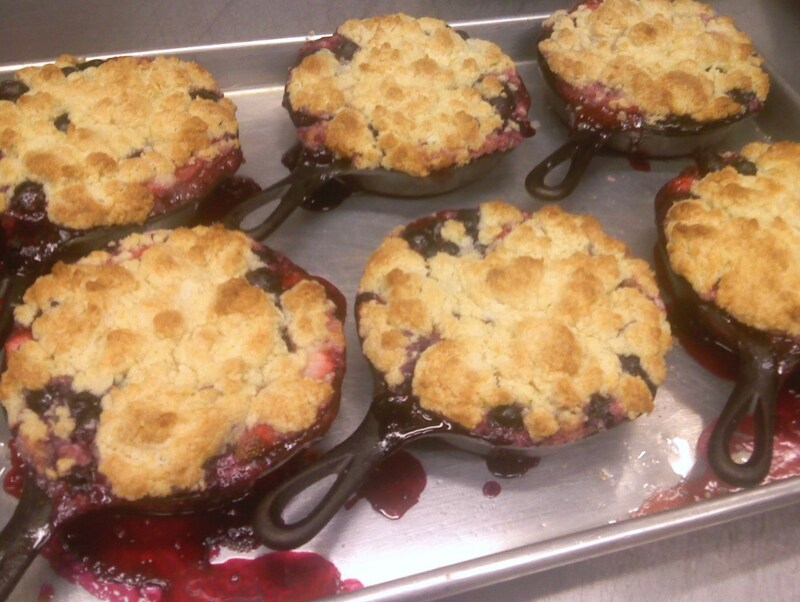 I made these beauty-ful berry-ful Mixed Berry Cobblers at work today. 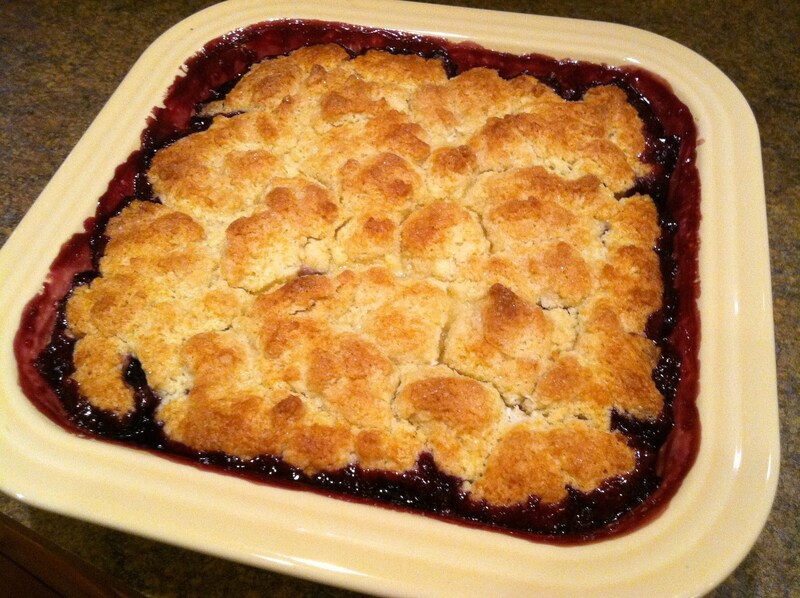 Cobblers are so perfect for this time of year, especially during summer when the berries are ripe and fresh. Here I used fresh strawberries, blueberries, and frozen huckleberries. This cobbler topping is absolutely perfect, and everything that it should be. I read that the topping is supposed to look kind of piece-y and lumpy, like cobblestones, which is how it got it’s name. Toss all together in a large bowl, set aside. Combine the dry ingredients in a mixing bowl. Work the cold butter cubes into the dry mix with your fingertips, rubbing into the dry mix until the butter pieces are the size of peas. Combine the egg, yolk, and cream in a small bowl, stir together, then gently stir into the flour mixture only until combined, careful not to over-work or over mix. The dough should be loose, lumpy, and light. Pour fruit mixture into a buttered baking dish (9 x 9) or individual baking dishes. Carefully drop spoonfuls of dough on top of fruit, leaving it loose and lumpy, it should look rough and rustic, like cobblestones. Bake until topping is golden brown, about 40-50 min. Enjoy warm or at room temperature, better yet with a scoop of Vanilla Ice Cream.